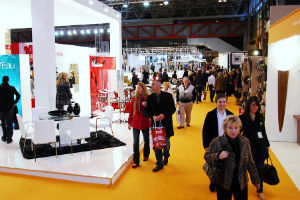 The Lighting Show at the NEC Birmingham is an annual event aimed at lighting for the domestic market. Exhibitors are mainly manufacturers of domestic and decorative light fittings. The first thing that was evident was the absence of LED’s. Whilst there were a few bulb distributors exhibiting LED products, we couldn’t find a single manufacturer of decorative light fittings that were using LED’s in their luminaires (light fittings). Why ? Quite simply, the manufacturers won’t utilise LED light sources because the additional cost associated with embodying an LED would put the cost of the luminaire beyond the pricing point that the customer would be prepared to pay. The quality of light isn’t as good as a domestic or Halogen light bulb, so using LED’s doesn’t offer enough added value for them to be a viable light source in the domestic market. Which Bulbs are being used ? Why? They provide a crisp white light, are dimmable and in the case of Halogen save 30% energy whilst lasting twice as long as a normal household bulb. We found some great new products at the show that we will be stocking soon. So watch this space. We can now supply a low energy 20w bulb in both bayonet and screw cap that can be dimmed using the supplied remote control. We are so excited about this product that we have tested it already and we are delighted with the results. We will place our first order shortly. Please call our sales office on 01494 880099 to check pricing and availability.